More adult women are getting pimples than ever before, according to a study presented in March at the American Academy of Dermatology annual meeting. Today, clinical acne afflicts the complexions of 45 percent of women ages 21 to 30, 26 percent of women ages 31 to 40, and 12 percent of women ages 41 to 50, according to the study, conducted by researchers at Massachusetts General Hospital. Just as you may see a little thinning in your hairline or the slight shadow of a moustache, more blackheads and blemishes are a sign of aging. “About a third of women will get adult acne, usually in their early 30s, even if they didn’t have breakouts when they were younger,” says Beverly Hills dermatologist Dr. Stuart Kaplan. “Starting in your late 20s, estrogen levels decline faster than testosterone.” Because testosterone is an androgenic hormone, it increases masculine qualities (hence the new facial hair) and boosts oil production, plugging your pores and causing blemishes. The difference between adult acne and the teenage type? Small red bumps (not painful, cystic pimples) are more common when you’re older, according to Kaplan, and acne along the jawline or around the mouth are a telltale sign that you’re dealing with a hormonal breakout. If I see a client who has tried everything to get rid of their acne I always ask them about their diet and suggest trying a low-dairy, low-glycemic diet. For some people changing their diet is really what helps their acne. I also truly do believe in a strong link between what is going on with our skin and our stress levels. Though I know it can be very, very difficult finding a way to relax can be very helpful for your skin. But let me emphasize again, as I have done in the past in this blog, that everyone is very different and what could trigger your acne could be something completely different than what triggers your best friend’s acne. I love Chapter 3: Targeting Your Acne Triggers from the book Healing Adult Acne by Richard G. Fried, MD, PhD because it helps you really track and figure out what is happening with your skin so that you are no longer playing a guessing game about what is causing your acne. First and foremost, I would never recommend reaching for the same anti-acne products that are marketed to teenagers in order to treat your adult acne. For many adults milder anti-acne products work best. Having said that the one prescription topical skincare product that is both anti-aging and anti-acne is Retin-A (or tretinoin, its generic name). There are many different forms of Retin-A available so I suggest seeing a doctor for a run down of your best options if this is the way you want to treat your skin. Doctors also have available to them in-office light and laser therapies that can effectively treat acne with little or no downtime. Going to an esthetician for an evaluation of your skin can help you as well since estheticians can also recommend a good home care routine for you. If your acne is really severe you may have to take medication, but this is a decision that you and your doctor can make together. Schlosser advises patients to use noncomedogenic and sensitive skin products in order to reduce the formation of new acne lesions and to minimize skin irritation. Avoid cleansers or other skin care products with scrubbing particles or a gritty texture, because they can irritate the skin. Use a noncomedogenic moisturizer daily. Apply the appropriate amount of topical acne medications (enough for a very thin layer, generally a pea-sized amount for the face) to the skin. Using more medication than is recommended will not produce better results, but may cause more irritation or dryness. When starting treatment with topical retinoids, Schlosser advises that the therapy should initially be applied three times a week in order for the skin to get accustomed to it. Over time, the frequency of the medication should be gradually increased with the goal of using a topical retinoid every night. Avoid picking, squeezing, popping, or otherwise manipulating acne lesions to minimize trauma to the skin and help reduce the risk of scarring and secondary bacterial infections. Bottom Line: Do not give up hope if you suffer from adult acne! There are numerous treatment options available and lifestyle changes that you can make in order to control your breakouts. 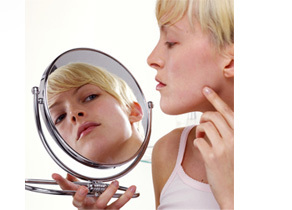 What is considered to be “clinical acne”? I’m 26 and almost always have 1-2 zits somewhere on my face, but I have been that way since a teenager. Just wondering if this is normal, or something I should be concerned about. Your acne sounds very normal. It doesn’t fall into the category of “clinical”. I would see if you can determine if there is a pattern to when you break out – perhaps around your period, etc. – so that perhaps you can control the breakouts better. For my adult acne clients I like to recommend PCA Intensive Clarity Treatment. With 0.5% pure retinol, phytic acid, phenylethyl resorcinol and gluconolactone. It is the ultimate nighttime treatment for those prone to breakouts and hyperpigmentation. I am 40+ and get acne outbreaks here and there when I am no being diligent about keeping my skin clean. It’s a constant battle that you always thought would end when you got older. Not for everyone I guess. My age is early 30…I also had some experience with acne problem…but when it comes to acne problem my solution is always doing more regular exercises…some of my friend said that what cause acne is because we lack of sweating so the dirty blood come out through acne..So if you are doing more regular exercise such as jogging or run or any exercise you like as long as it could cause you sweating‚ that dirty blood will come out through sweat from our exercises and you can prevent acne from happening…I don’t know if this will work for you…but for me this solution work perfectly well for me.. Thanks for the post! These are great tips. What do you think about acne treatment methods like chemical peels and laser treatments? Can you recommend any makeup products for adults who suffer with acne? Chemical peels are a great way to get rid of acne and acne scars. Laser treatments can help get rid of scars. Be sure to a consultation before any treatment. A lot of people with acne and oily skin like mineral make-up since you can get complete coverage without a heavy feeling. Whatever make-up you choose be sure to check that it says “won’t clog pores” or “noncomedegenic” or “oil free”. Changing my diet is one thing that has really helped with my acne. Thanks for sharing. I have been suffering of acne since 12 (!) years old till now 30 years old and my condition never really left me in a piece. Anytime when doing something else than my daily routine acne appears again!